Mix all ingredients in a medium-sized mixing bowl. Start by adding sugar and cocoa to the bowl. Heat milk in microwave at high (100%) 1-1/2 minutes or until hot. Gradually add hot milk to cocoa mixture into the bowl; stirring until well blended. 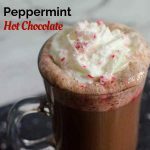 Stir in peppermint extract or syrup. Pour into 2 large mugs for drinking. Top with whipped topping and crushed peppermint candy.